Up to two pets are welcome in each cottage for a supplementary charge of £30 per pet to cover additional cleaning. We understand that your dog is a member of the family and we trust that your furry friend will have just as much fun as you will here at Unique Retreats. They’ll love exploring the North Yorkshire Moors National Park, Dalby Forest and North Yorkshire Coast. We know that staying somewhere new comes with additional challenges but we hope to make taking your dog on holiday as easy as possible. If you have a well trained, clean and well behaved dog and want them to join you then you shouldn’t have to compromise on the quality of your accommodation when it comes to choosing somewhere to stay, after all the vast majority of luxury self catering properties graded 5 star gold by Visit England don’t accept dogs – but WE DO! Below you’ll find details of what we provide, local dog services (groomers, walkers, vets), as well as independent advice on taking your dog on holiday from the RSPCA. 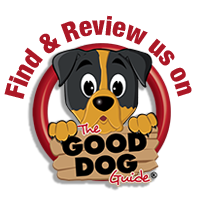 There is also lots of useful information to help you plan dog-friendly days out as well as walks direct from the cottage door. Click to download the RSPCA’s useful guide to taking your dog on holiday factsheet which is well worth reading. Not all our guests have pets so, for the benefit of everyone staying at the cottages, we ask that you follow the Dog Rules. Please remember taking a holiday with your dog is not the same as taking a holiday from your responsibility as a dog owner. Unique Retreats provides Dog / Pet friendly holidays for Whitby. We welcome pets in all of our 5 Star gold awarded cottages and each cottage has its very own stunning views and wonderful walks from your front door and as well as a welcome hamper for you, there’s one for your dog too ! We are also respectful that many of our guests don’t have dogs, so don’t want to know that a dog may have stayed at the cottage before them. For this reason as well as our house rules for dogs, our cleaning standards are superbly high, so you definitely won’t be able to tell a dog has stayed before you. We will always help you locate the dog friendly beaches as well… all tried and tested by Maisie’s team! We know how important your dog is to you, so we welcome well behaved dogs in all our cottages for £30 extra per dog to your booking. Cowslip Retreat is a bolthole for two people, perfect for either a long weekend away from it all or for a delightful honeymoon hide-away. The spacious, open-plan living/dining room with wood-burning stove has a kitchen area and bedroom area with double bed. The bathroom has a large bath with separate shower, basin and toilet. Ewelands House is a fab getaway for families or friends – spacious and open plan, there’s enough room to find your own space here. With gorgeous fabrics and furnishings, wood burner and a quite remarkable view, this is the perfect idyll for your holiday. Spring, Summer, Autumn and Winter holidays are all very popular. ‘Out of season’ holidays are reasonably priced and have the advantages of the weather not being too hot for your dog. There are lots of wonderful beaches where your dog can roam and romp, all detailed in our cottage guide. We do make a charge of £30 per week per dog or part week. This is because we have to allow time for an extra clean. We do this because several of our guests are allergic to dogs and we feel that the charge helps towards us ensuring that the next person won’t be likely to come across a stray dog hair that might set them sneezing! We are dog lovers and owners ourselves and close by Sheep, cattle, horses, chickens and ducks roam the fields. We do ask guests to follow the country code and close all gates and keep dogs on a lead when in the close vicinity of stock. We have had some wonderful times walking with our own dog in and around Whitby over the years and she has developed quite a following amongst our guests over the last few years. Our properties are gorgeously furnished at great expense and are presented in an immaculately clean condition for you and we wish to keep them that way, otherwise they wouldn’t be ‘gorgeous’ for very long ! Our excellent cleaning standards ensure that guests without dogs can confidently stay without detecting doggie smells or stray doggie hairs. However it would be almost impossible to maintain these high standards if our ‘house rules’ for dogs weren’t respected, so we appreciate your co-operation and respect for other guests. As dog owners ourselves, we understand that you want to bring your dog on holiday with you. Here at Unique retreats we are very dog friendly. We are very happy to welcome well behaved dogs (and their well behaved owners), but for the sake of peaceful coexistence and a happy holiday for all, we would ask that you follow a few simple rules, and remember that taking a holiday with your dog isn’t the same as taking a holiday from your responsibilities as a dog owner. That way we can keep our 5* gold cottages both dog-friendly and 5* gold. Many thanks for your cooperation. We provide water and food, so you don’t need to bring your own. The towels are for muddy paws. There is a dog hose pipe with sponge to clean mucky dogs. Please don’t use the bath or showers. You will also find Dog walk suggestions of varying lengths, and you’ll find a laminated OS map in the cottage and a torch for your evening stroll. There is also laminated walks that we’ve enjoyed – and more importantly Maisie has enjoyed, in our bespoke cottage guides. On departing, please ensure that the cottage is clean and free from dog hair before you leave. There is a vacuum cleaner for your use, which we clean out every week. We do have house-rules for our doggie guests, but they are what you would expect in any luxury holiday cottage accommodation i.e. not being allowed on the sofa’s or beds – after all they wouldn’t be ‘luxury‘ for long if we allowed this. We ask that worming and flea control programmes are up to date for the benefit of your pets and as a courtesy to subsequent guests in your cottage. Please ensure your dog is microchipped and that it is registered to your current permanent address. While you might like to enjoy different food whilst you’re on holiday, our pets are happiest if their diet remains the same. So please make sure you bring sufficient food for your holiday as well as any medication they might need. If you are going for a day out somewhere dogs are not permitted, please remember that dogs must not be left unattended in the cottages unless crated. You can register with www.tailster.com (Tel: 0208 0040860) to book a local dog walker. However, if you are having difficulty booking a dog walker, please let us know in advance and we will do our best to find someone. Details are given in our cottage guides of local ‘doggy day care and walking’. Over half our guests return, and many return regularly with their dog, who, as the years go by also seem to develop a special affection for Whitby and the holidays they enjoy here.